Hi Karen! This seems to be the world we live, for almost any industry. I laughed when I read your thoughts that you wrote weeks prior because I have felt the exact same way about it all. In my current professional field (photography) it is the same. Blogging and social media are huge as you know, as are trying to connect with people in a way to get them interested in you, thus interested in your work. It is sometimes tiresome and time-sucking and diverting away from the very thing we are trying to put out there. But there is something to it I think. If I look at the blogs I follow regularly and WHY, it is either because I like reading what the blogger has to say and am challenged by it/learn something from it or I have loved what they produce (stories, photos, food, etc) and want to follow along their journey. Many of them blog regularly, which probably keeps them (and their product) on the forefront of people’s mind. I first visited your blog because I loved your stories. And I continue to visit because of the first reason I listed :). Who knows what the balance is though in creating that platform and working on the actual thing we are producing. One day at a time is what I keep telling myself. And grace. Lots of grace. So excited to hear Sky is rolling forward!! Thanks for sharing these insights, Erin, from another professional field. They touch on something about modern life I’ve been ruminating on, but haven’t been able to really get my mind around yet. It’s all starting to make me think of a beehive…. Anyway, I appreciate your thoughts and your encouraging words. Oh, and your photography is stunning! 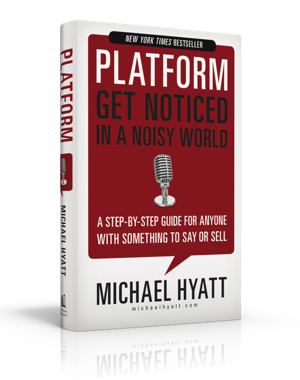 First impression I have with Michael Hyatt’s book title is that he needs to create some dissatisfaction for a person to buy into what he’s selling. Maybe I’m wrong. Now that’s interesting. Having rules and order and systems always make me want to get out from under them! Which is precisely why I have to hold myself to important ones–like going to church and spending time in the Word and in prayer. I finally realized I couldn’t have the argument every day whether or not I was going to do those things. I wouldn’t blow off an appointment with a friend or an editor or agent. Why would I think of doing so with God? Once the matter was settled, then it wasn’t as hard. For work, I think the non-optional experience of going to the classroom day after day, prepped me to sit down at the computer on a nine-to five sort of basis. The social media part of my day is the part that I have to harness, though. I either neglect it or I focus too much on it.